Before I go any further, I need to clear the air with the following disclaimer – Many would consider me a Google Fanboy. I have owned at least 5 different Chromebooks over the past few years and generally do see them as useful tools. I may be a bit harsh in a few of my remarks however much of this stems from the fact that I know what Google is capable of if they put their minds to it. Google does have a history of releasing “half baked” solutions which normally evolve into something great so this post is simply to push for these improvements. Undoubtedly one of the most exciting feature of ChromeOS is the fact that many devices either have the ability to run full Android applications. These supported devices are also being given access to the full Google Play Store which immediately opens the door to over a hundred-thousand applications that work offline and online. For the most part, the play store on ChromeOS itself is very well executed and most applications work flawlessly. There are however a few things that are half-baked in the Android Implementation that really need to be fixed. Just about all Chromebooks have a MicroSD card slot so there is really no reason why Google cannot make better use of the external storage. Of course this must be done in a secure way – fortunately Google has already solved this on Android using Adaptable Storage. I would love to see this brought over to ChromeOS. This would allow both ChromeOS and Android to share up to an additional 256 GB of storage on top of the built in 32 GB storage while still keeping everything secure. As I will be covering in a later section of this post, ChromeOS is a bit lacking when it comes to VPN support. It is very possible to install a VPN application inside of the Android Runtime via the play store and it works for the most part – only for applications that are running in the Android Runtime. This would mean that you will need to install Chrome on the play store to have Chrome’s connection tunneled through the VPN Tunnel, the main Chrome browser is still sending data in the clear. I would love to see Google re-work the VPN APIs to setup the VPN on the ChromeOS instance instead of the Android instance. I am not going to say much about this one as Google is currently working on bringing Android 7.1.1 to the Android Runtime which should fix many of these issues. Android 6.0 has several issues when it comes to Android Application Multitasking. Forget writing a blog post in Chrome while binge-watching Netflix – once you click on Chrome, your video will pause. This sort of issue should go away with Android 7.1.1 or even Android O. Now that I have gotten the Android Runtime shortcomings written out, it is time to move onto the star of the show, ChromeOS. 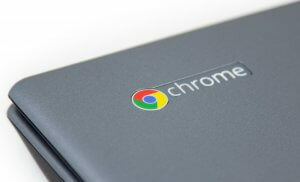 Generally ChromeOS is a great operating system that offers speedy performance and several security advantages. I do know ChromeOS can be a bit sluggish on some hardware but it performs flawlessly on the Samsung Chromebook Plus that I am currently using. It is not abnormal for me to visit local cafe’s and coffee shops to research things and get work done, I also tend to do a fair amount of travel. Sadly in both of these scenarios, I am limited to using a public/open WiFi. Normally this is not an issue for my Ubuntu and Windows machines as I just fire up the OpenVPN client and connect to my OpenVPN server to securely access the internet and evade many forms of filtering – ChromeOS on the other hand is really a half baked mess. It has gotten so bad that I ended up buying a small travel router that runs OpenWRT that acts as a WiFi Bridge. This small router has a OpenVPN client that will automatically route data through my OpenVPN server. If you think the Windows store is a mess – you clearly have not seen the ChromeOS app store. There are many applications that are nothing more than browser windows without toolbars that do nothing more than to display a website. Out of the 10 thousand + applications, I would only agree that there are less than 500 actually useful applications that are useful. This problem can be excused in a few ways due to the addition of Android Applications but I really feel that Google should focus more resources on quality applications and extensions as they have done with Android. These are simply my thoughts on the current state of ChromeOS – Hopefully I will be able to look back on this page in a year and laugh. If you are a ChromeOS user that has their own list of issues, let me know and I will add them.